A radiation detector’s sensitivity is important when designing survey plans. A measure of sensitivity is minimum detectable activity (MDA) which is the lowest amount of activity required for a signal to be distinguished above background. It has been known for some time that the efficiency of a moving detector can be improved by slowing the speed of travel. The Multi-Agency Radiation Survey and Site Investigation Manual describes but does not quantify this effect. Decreased efficiency at higher speeds results in higher MDAs and thus less sensitive detectors. The purpose of this research is to specifically define the relationship between detector MDA and speed. Python was employed to calculate solid angle from equations developed by Masket and MCNP6.1 simulations were used to determine detection efficiency for a moving detector. Using these results efficiency as a function of detector travel speed was fit to a modified four-parameter logistic function (M4PL). The result of this work is a well defined relationship that can be used to predict MDA as a function of speed. The relationship can also be used by operators to determine the optimum speed needed to meet a predefined MDA. Understanding this relationship between detector speed and efficiency will improve detector performance in remediation efforts and national security search operations. 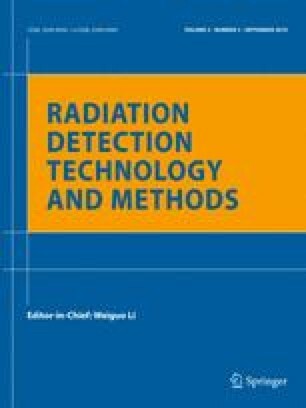 The M4PL function developed in this research allows optimizing remediation and wide-area radiation survey activities by setting maximum survey speed to meet a predetermined MDA.